Note: Leonard was born Arthur Leonard Bamford, but seems to have been known as Arthur Leonard and Anthony Michael Leonard at various times in his career. Arthur Leonard was born Arthur Leonard Bamford in Leicester in 1874, although one source suggests he was born in Ireland. He began his career with Leicester Fosse in 1895 having previously served with, and played for, the 17th Leicestershire Regiment. Bamford, as he was then known, walked out on the Foxes and after spells with Rushden Town and Sheppey United, signed for Glentoran. It was whilst playing for the Belfast club that he was spotted by Small Heath (Birmingham City as was), who he signed for in 1901 for £120. However, Leicester recognised him as their player, despite a change of name to Arthur Leonard, and he promptly disappeared again. He is then said to have sent a telegram to his wife saying that he was in America. When he was spotted in Bristol he was persuaded to return to Birmingham, and the dispute was settled by Small Heath paying Fosse an extra transfer fee of £20. 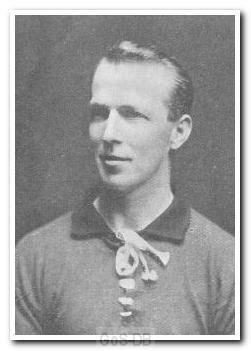 The expense paid off with Leonard finishing the 1902-03 season as top scorer, and he totalled 26 goals in 75 games in his two years with the club. He was a big hit with the Birmingham fans, a "bag of tricks", and was regarded as the star performer in their side. An Irish Amateur International, Leonard was primarily an inside-right but also played at outside-left early in his career. His history is further complicated by the fact that in the latter part of his career he is recorded as being Anthony Michael Leonard, nicknamed 'Micky'. In 1904 Leonard joined Stoke and scored three times in 14 appearances over the next two seasons. After a short spell with Edinburgh-based club St Bernards he joined Reading and then Clapton Orient in 1906, where he managed seven goals in 37 games. In the summer of 1907 he moved to Home Park and spent a single, successful campaign with Argyle. The club handbook for that season describes him as "a really artistic player" and also "one of the best Baseball players in the world". Leonard finished his career with a further spell at Reading.